contact with Celestron and brought the mount with approved RMA shipping label to the UPS store where is was dutifully bubble wrapped put on the truck. Now I just have to wait and see what happens. Maybe I will be able to report for my self what the repair service is like. Anyway, as a physicist wannabe, I had plenty to do and continued my study of quantum fields and gravity. I even tried to entice Astronomer Assistant Ruby to begin an introductory review of general relativity (see attached photo), but she just continued her nap after just licking the book outside cover. At least she didn't chew the book like she has tried to do with everything else in the observatory. 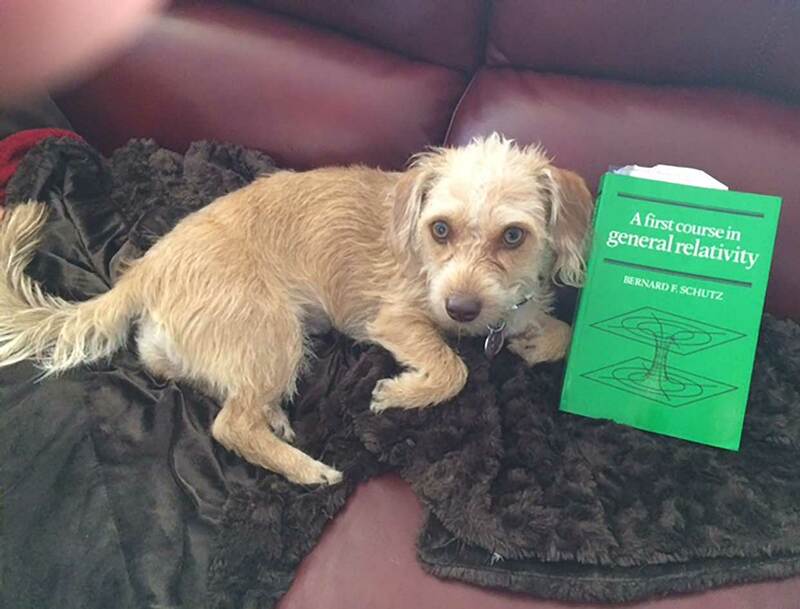 One of the quantum mechanics textbooks I've been using is "Quantum Mechanics: Fundamentals" by Gottfried and Yan. Of special interest to me was the chapter dealing with the various interpretations of quantum mechanics. While all physicists agree on how to do the calculations and be able to predict the probabilities for the observed outcome of an experiment, it seems there is an embarrassing lack of agreement as to why the quantum world behaves as it does and why the equations work so well. This is a topic that all students, including me, eventually start to think about. Although I mostly associate with the school of thought that we "should just shut up and calculate" because no one understands why quantum reality is as it is, it's just that we can calculate and predict in order to build the modern technologies we use everyday. Sometimes, late at night, or when I'm at the bar with my martini, do I also consider the big why is it so question. 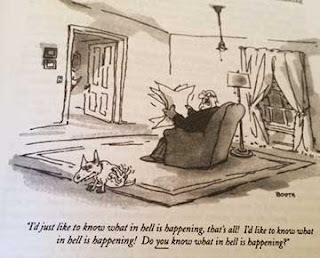 Anyway, the textbook had a cartoon, which sort of sums up all student's frustration. See the attached cartoon, courtesy of the textbook. 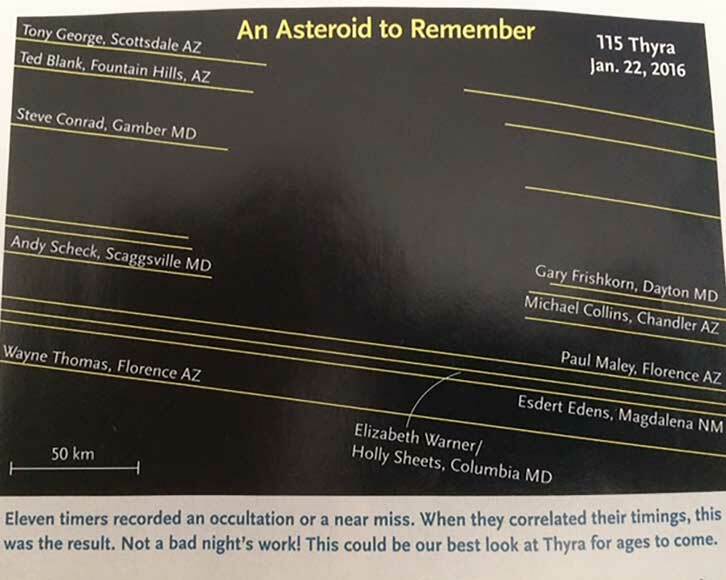 There was an interesting article in this month's Sky and Telescope magazine, which described how amateur astronomers can measure and determine the size and shape of asteroids. What? How can an amateur resolve the size of an asteroid? Yes, it seems possible! Look at the attached photo, courtesy of Sky and Telescope, September 2016, showing one example. 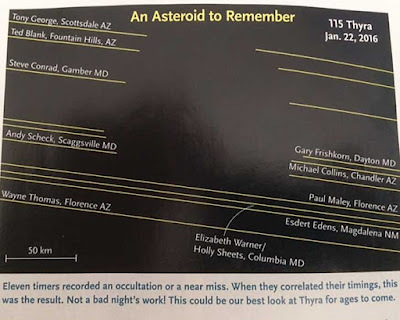 When the asteroid occults background stars and the timing of occultation and return are plotted and arranged for many observations from different locations, the size and shape of the asteroid can be estimated. Pretty neat! I might have to try to do this sometime. How about you? Lastly, AAVSO sent out a request to all of their amateur members to consider scheduling repeated light curve observations of a variable binary star. This request originated by professional astronomers at the University of Toledo, who need additional amateur support in a study the colliding-winds binary of about magnitude 6.7, V1687 Cyg (WR 140, HD 193793), which is a long period, about 8 years, which the pair will be in periastron in December 2016, and they will be monitoring the binary in x-rays and infrared from spaceborne satellites, but they need additional visible observations for comparison. Wow, magnitude 6.7 star is doable with my amateur equipment and I've been preparing for several months now to conduct light curve measurements. Can I do it? Am I ready to do it? Well, not quite, but I think at least I will try to find the binary star and at least take a photo of it and try to determine its magnitude. But how to begin? I have to first of all find the star in the sky. The AAVSO announcement identified the location as RA= 20 20 27.98 and Dec=+45 51 16.3, so if I get a good scope alignment I can slew the scope to those coordinates and take a picture. The good news is that even though I don't normally speak RA and Dec, both of my mounts will accept RA and Dec commands and also, from the star name, we know that "Cyg" is an abbreviation for the constellation "Cygnus, the Swan", which is easily visible at this time of year. My alignment is not that great so all I know is that I will be pointing in the same general direction and will somehow still be able to identify the right star in the photo. I'll need to dig a little deeper into my laptop software programs. So, I can't use my big scope, with the AVX mount in for repair, but I can use my smaller Ioptron AZ Mount Pro with just my camera and 600 mm telephoto lens. I can't monitor in all of the color bands requested, but I can do a reasonable job in the green band. Ok, so the nighttime marine layer was late coming a couple of nights ago, so I dragged out the mount, did an alignment and by the time I slewed to Cygnus, the marine layer had swamped out any possible view. Darn! Oh, well, as we all have found that is the nature of what happens to amateur astronomers, and professional astronomers too. Anyway, I did finally get one real astro photo to share. Remember last time I mentioned that Resident Astronmer Peggy had read that the Moon and Jupiter would be very close together this month, but would be quite low on the horizon, which prompted my semi-serious proposal to get or rent a scissor lift so that we could be above the rooftops in order to see the conjunction just above the horizon. 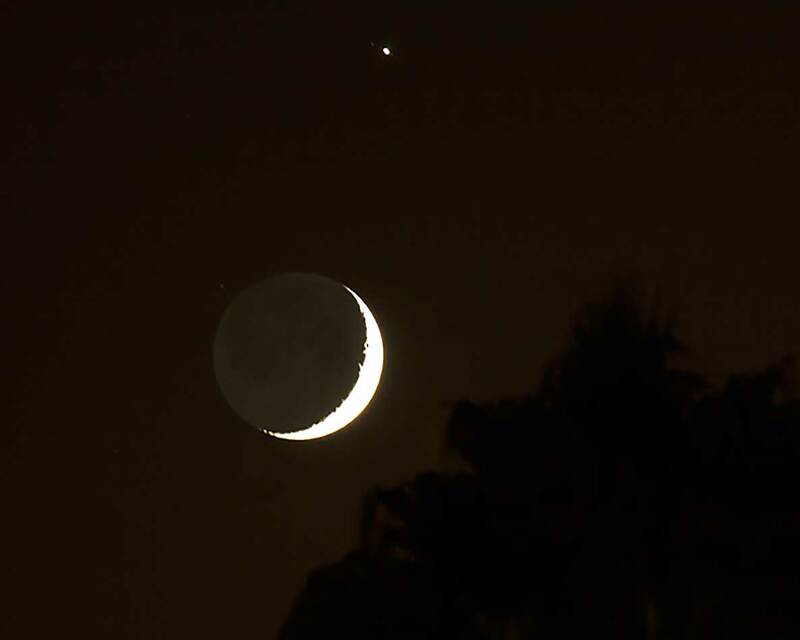 As it turned out, the conjunction was still visible and above the horizon for me to take a couple of images. See the attached photo with 4 second exposure @ 8:57 PM, 300 mm lens setting to get both Moon and Jupiter. You can see the pair is just barely above the palm trees, but still visible. Ok, that is about it for this week. Next week we have our scheduled tour of the Big Bear Solar Observatory, located, at of course Big Bear Lake. That should be fun to spend some time in the mountains.